Noticing New York: Embroiled In Embarrassment of Hosting Controversial Advertisement MTA Considers Banning “Issue Advertising”: What About Barclays LIBOR Scandal? 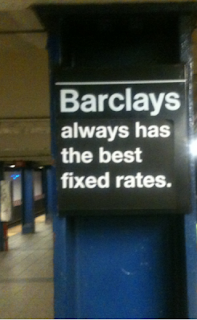 Embroiled In Embarrassment of Hosting Controversial Advertisement MTA Considers Banning “Issue Advertising”: What About Barclays LIBOR Scandal? You would hardly guess that ads pull so little financial weight when surveying the clamorous melee of advertising cluttering the MTA environment. Faced with the dilemma of being between this hard-to-stomach place and the court ruling the MTA accedes it must follow, the MTA is now considering having its board adopt a total ban on future issue advertising. Interesting! What does that mean for the MTA’s advertising promoting the Barclays Bank with the “Barclays” Center and the “Barclays” subway stations? Will the MTA now adopt a policy that would have prohibited its current promotion of the LIBOR scandalous British bank? It will at least have to mull over whether whatever policy it adopts should naturally entail such implications. More important, the Barclays issues directly concern the MTA itself. The MTA has been intimately involved in producing the “Barclays” Center arena. The MTA is part of the reason the arena is a huge net loss to taxpayers. The MTA tossed in additional financial benefit to the developer by giving it the ability to name key subway hub stations “Barclays” virtually for free. Last but not least, the MTA is now, itself, looking at suing Barclays Bank for losses it suffred in connection with the LIBOR rate-fixing. All of this presents some pretty big issues front and center. If the MTA is going to start exercising control over advertising that concerns controversial issues the Barclays/MTA issues above are certainly big enough to deserve such attention. In a better world oughtn’t the MTA be reserving to itself the ability to terminate promotions that provocatively and questionably favor one side of high-profile and controversial issues? That should, by rights, include termination of favorable promotion for a bank like Barclays at a time like this. The pro-Israel, anti-Arab ads the MTA will have to allow in subway stations (they will go into ten of its stations) were created by the Pamela Geller’s American Freedom Defense Initiative (which fought against Islamic Community Center near Ground Zero). It's an organization that intentionally seeks to take controversial sides. The same ads ran in the San Francisco’s transportation system and the transit authority there accompanied them with huge disclaimers appearing alongside stating that the transit authority disavowed the message promoted in the advertisements the system was hosting. Now wouldn’t it be interesting if New York’s MTA were to decide to utilize disclaimers in connection with the opening of the “Barclays” Center to say that despite its vast subsidies to the Atlantic Yards mega-monopoly and its “Barclays” Center arena, and despite renaming subways hubs by the name of “Barclays” at virtually no charge to either the developer or the bank, that the MTA disavows and does not endorse Barclays Bank or the bank’s banking improprieties. To be effective the disavowals would have to be as large as the “Barclays” logos on the arena's sides and roof, and would have to be as ubiquitously placed as the “Barclays” name now appearing on innumerable subway pillars. For now we’ll probably have to settle for the balance created by guerrilla political street artists who are stealthily modifying the MTA’s Barclays branded subway pillars to say things like: “Barclays always has the best fixed rates” and other interesting variations of criticism the bank probably deserves. The MTA is reportedly not, like the San Francisco TA, going to adopt a strategy of disclaiming counter-advertising with respect to the Middle East conflict ads. MTA does not decide whether to allow a proposed advertisement based upon its viewpoint and the MTA does not endorse the viewpoint in this or any other paid advertisement. MTA is currently reviewing its policy of accepting non-commercial viewpoint advertisements. There’s been no comparable MTA disavowal the Barclays promotion yet. Should such a distinction be permitted: “Barclays Bank Bad” = prohibited “non-commercial ad” speech while “Barclays Bank Good” = permitted “commercial speech”? Board Mtg. – 9:30 a.m.
• Registration opens 15 minutes before scheduled start of committee meetings and 30 minutes before the start of each board meeting. • Registration must be done in person. • Statements must be about agenda items only. • Two minute speaking limit. • Speaking time may not be transferred.